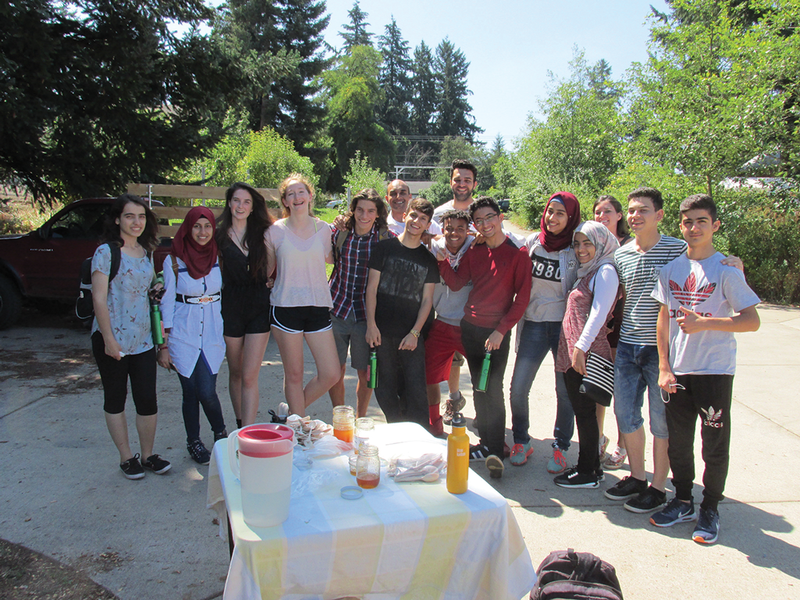 Portland Urban Beekeepers (PUB) hosted a delegation of enthusiastic, Iraqi Young Leaders Exchange Program students at the Portland Urban Beekeeping (PUB) treatment-free apiary located at Zenger Farm, SE Portland, OR, a sustainable, educational, urban farm. The delegation’s U.S. visit was financed by the U.S. Department of State arranged by the World Affairs Council of Oregon. Following a short presentation about bees, moved to a hands-on experience with beekeeping practices, and finally to tasting honey. 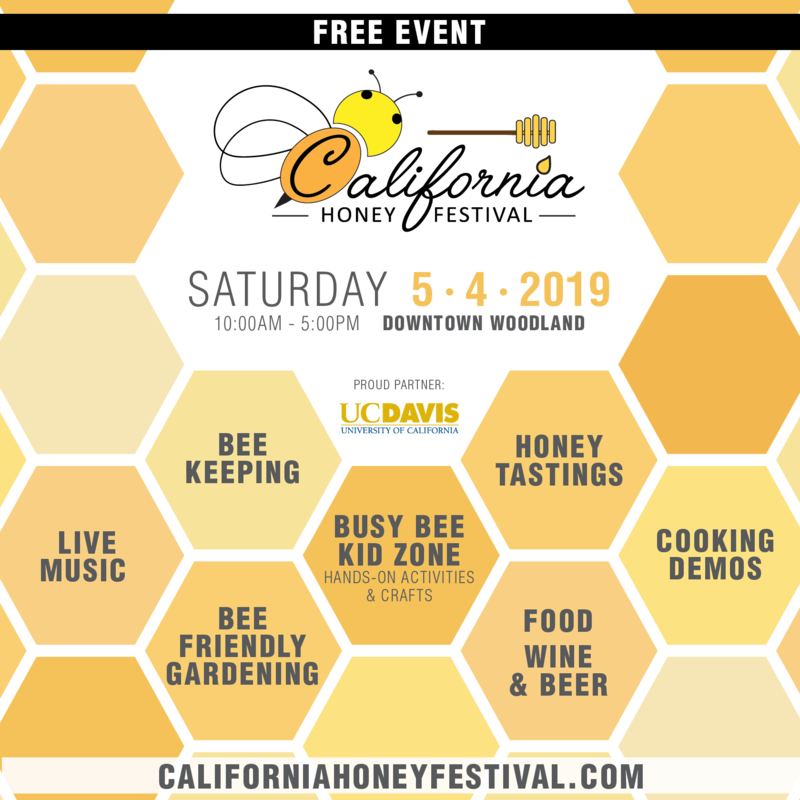 The PUB beekeepers demonstrating honey bee care and health management were: Linda Zahl, Susie Wilcox, Charlie Vanden Heuvel, Annette Carter, Frank Gransha, Lilly Glaeser, Micah Hamley, and Luca, (teenager). Iraqi Young Leaders Exchange Program group. 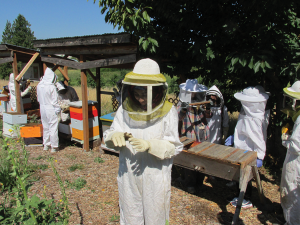 The moment the group exited the bus at Zenger Farm their faces displayed excitement coupled with a bit of anxiety about meeting Apis mellifera ‘face to face’. 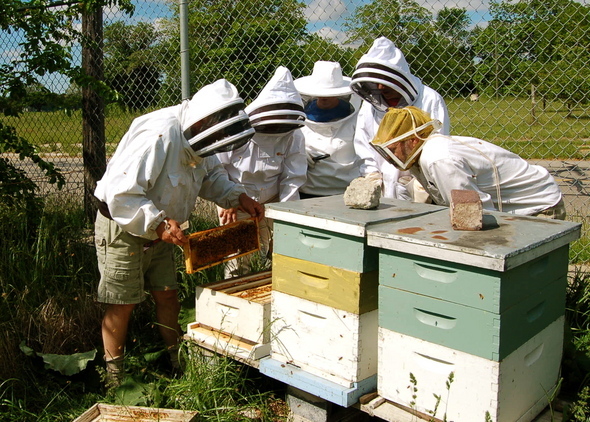 Annette Carter gathered the group around the apiary for a short discussion on honey bee casts, drone congregation areas, plant pollination, nectar, and of course bee stings. PUB Members then broke the students into smaller groups delving into the hives to witness first hand hive activity. Each ‘hive PUB mentor’ turned their hive tool over to the students to enhance their personal experience. The expression of joy was evident as they lifted frames of capped honey, capped brood, pollen, and nectar. Although fully suited, each smelled the hives’ honey and propolis all the while discussing the virtues of their apitherapy qualities. 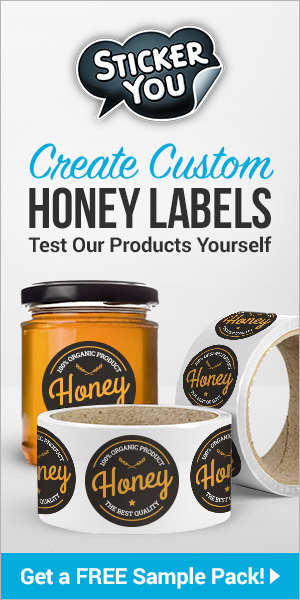 As the treatment of gout with honey is popular in their region it became a topic of discussion (Najafi, Tahereh Eteraf-Oskouel and Moslem) as did honey’s and propolis’s inhibitory effect on bacteria. One of the hives was experiencing Idiopathic Brood Disease Syndrome (Oregon State University insect ID Clinic) allowing a great opportunity to visualize hive disease. 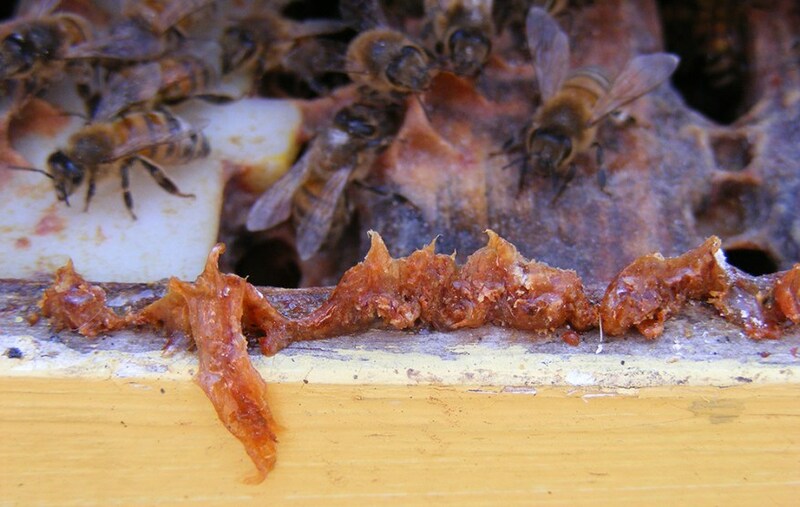 Iraq’s existing hives, according to a report by Sanders in 2005 have 10% and 40% Varroa mite infestation. Due to time constraints, discussion on treatments of this devastating issues did not transpire. Some of the group moved on to the Top Bar Hive for a discussion on the differences between it and the Langstroth Hive. While the Langstroth Hives predominately had frames with foundations, in the Top Bar Hive the students witnessed natural comb. 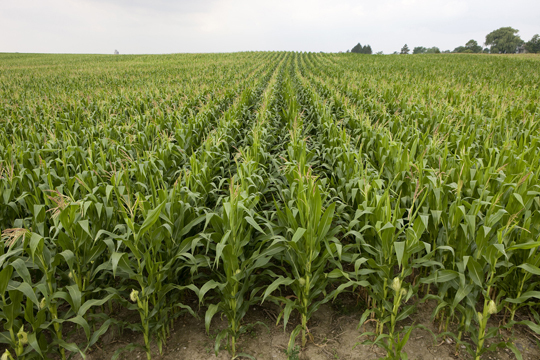 This provided an opportunity to discuss the bee’s wax gland and how comb was created. 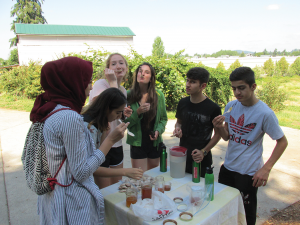 After the students’ apiary explorations, the group moved to a honey tasting table to sample different types of the hives’ gold, donated by PUB members from their local bees. Evidently this proved delightful.